A national practice focused on real estate, civil litigation and complex class and multiparty litigation. Our firm has some of the most experienced civil rights attorneys in the field. Newman Ferrara represents many of the city's largest property owners and managing agents, and handles some of the nation's most significant class actions and civil rights matters. 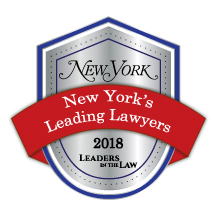 When the partners at some of New York's largest law firms need assistance with New York's arcane real estate law, or when investors, consumers, and those who have suffered civil rights violations require aggressive representation, they go to Newman Ferrara. With over five decades of experience at its disposal, Newman Ferrara has evolved into a national practice focused on Real Estate, Commercial Litigation, Civil Rights, Class Actions and other Complex, Multiparty Litigation. In addition to teaching at law schools and universities, lecturing at CLE programs and co-authoring some of the state's leading practice treatises, the firm's attorneys are regularly called upon by the media to offer their unique insights on the latest legal developments and trends. Newman Ferrara represents many of the city's largest property owners and managing agents, and handles some of the nation's most significant class actions and civil rights matters. Whether it involves the purchase or sale of real property, or representing litigants in convoluted disputes, the firm's lawyers work diligently to get the job done and endeavor to do so in an expeditious and cost-effective manner. Offering a comprehensive and multifaceted range of services, as well as a targeted approach to their clients' needs, Newman Ferrara provides big-firm quality without compromising the personal attention clients expect and deserve. Newman Ferrara remains committed to pursuing socially meaningful cases and will prosecute them in the most efficient manner and with the highest level of professional competence. The boutique structure of our firm allows us to provide clients with personalized attention and increased access to their attorneys and, when appropriate, Newman Ferrara works in conjunction with a network of counsel, nationwide. Keep up with the firm and current events pertaining to class action, civil rights, real estate, commercial litigation, real estate transactions, and medical marijuana compliance cases. Apr 19, 2019 BLACKSTONE WILL PAY RENT-STABILIZED TENANTS $1M. WON'T STOP THE LAWSUIT. Our firm has some of the most experienced civil rights attorneys in the field. Newman Ferrara maintains a varied and progressive legal practice based in New York City. Its attorneys specialize in complex commercial and multi-party litigation with an emphasis on real estate, shareholder litigation, ERISA, consumer fraud, products liability, and civil rights litigation.